If you're looking for new online slots then you have come to the right Is there anything better than the crunch of an apple, or having a nice sleep? You’re probably thinking, yes, yes there is, but that’s not the point. 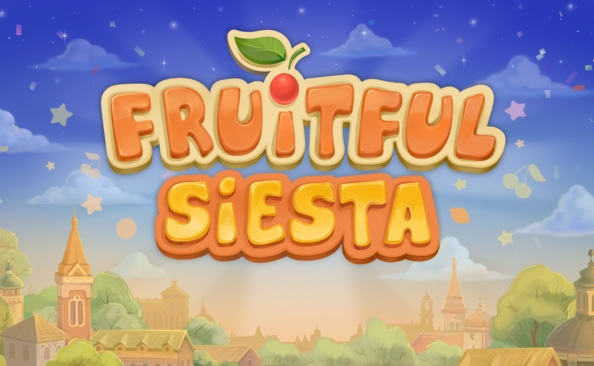 Fruitful Siesta transports you to a place in time where fruit and sleep are things of the only importance. Spin your way through this calm Mexican village and match up traditional fruit machine symbols of yesteryear. Playson are baby-faced in the online mobile casino industry as they have released 40 games in total, but the potential that seeps through this company is far superior to the number of the games they have released. What they have released provides refreshing graphics for all to enjoy and take in! Thanks to their high-quality games, their inventive themes and exciting game features, they can expect to become big players in the casino world one day! If you're interested in our slots promotions then please click here. Although Siesta means to take a nap, in Spanish, rest assured that this game will do anything but have you fall asleep! 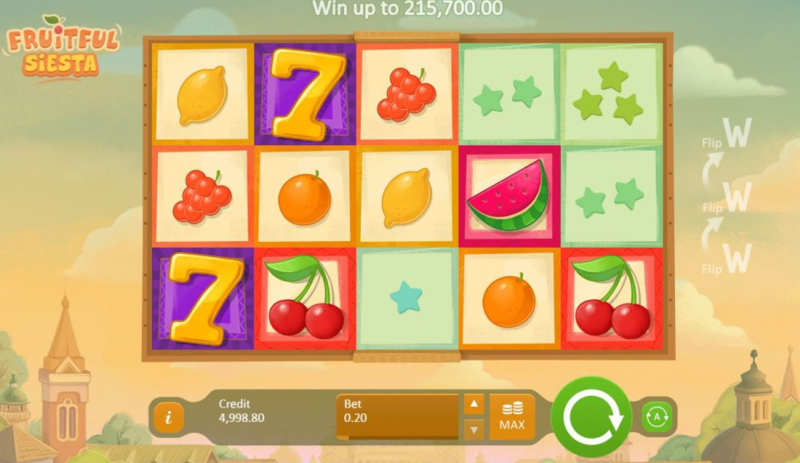 You’ll be able to get your 5-a-day and so much more in this fruity twist of a slot-game! The playful animation and energetic graphics used make this game an enjoyment for a variety of ages and types of players! Whether you’re looking for a 10-minute breather from the everyday or settled into win, the minimum and max bet of 20p and £100 makes it inclusive for everybody! The 5-reels are set against an idyllic countryside vibe, with earthly green trees, the historical churches, and the soothing orangey-green sky. Don’t get too comfortable though in this peaceful scenery as you will want to have your sharpest mind at hand to get your hands dirty and stuck into this marvel world! No fear though, you won’t be crushing fruit with your bare hands to make jam nor will you be picking grapes in vineyards until the sun sets. Instead, sit back in the comfort of your own space and spin the reels to reveal your fortune, away from the hard-laborious tasks that come with preparing fruit! As a bonus feature that is uncommon in online casino games, this game offers you a double chance to earn those rewards as you can line up the symbols left to right and right to left. Despite this, it is worth noting that there are no scatters, free spins or bonus rounds which do come with other slot-games yet the game introduces something new to the tables and we believe Playson makes up for that through this adaptation! Normally, the wild symbol’s purpose is to substitute regular symbols for other ones which will make it more likely for you to succeed in winning combinations. This is still the rule in Fruitful Siesta yet it will also flip all other tiles worth the same value. As a result, you will see a huge increase in your winnings as the entire board is now collectable and the rewards are yours for the taking! Another new slots games to get stuck into, Join today! There is no room for snoozing in this playfully animated game, accompanied with vibrant graphics! You can certainly take a nap though, after you have been given various chances to land the big bucks! From 20p a spin too, this game certainly deserves your time, and see how Easy it can be to win rewards with the array of bonus features that, such as the flipping tiles feature!